"OpenWeatherMap" finds the current weather condition in your area and displays the current temperature in the badge of the toolbar icon. Pressing the toolbar button opens OpenWeatherMap website. You can get more information from the tooltip without opening the OpenWeatherMap website (like location, wind speed or humidity of the currently selected location). What is the OpenWeatherMap extension and how can I use it? 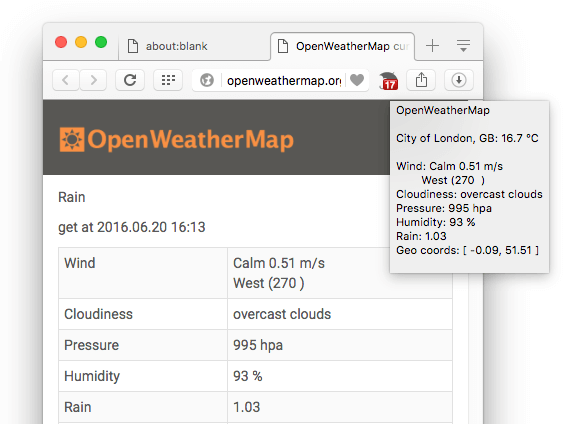 OpenWeatherMap is a lightweight cross-browser add-on to get updated weather condition from the nearest station on your browser toolbar. It uses OpenWeatherMap.ORG as the source of weather condition. Weather condition is fetched from the OpenWeatherMap.ORG once per 5 minutes or when OpenWeatherMap is opened in a browser tab. Since the extension does not offer a setting page, how can I change the location of the weather station? It is very simple. Just click on the toolbar icon to let OpenWeatherMap be opened in a browser tab. There is a search box on top of the page. Use it to find the station and then click on the station. As soon as the station is set, the badge gets updates from the newly selected station. Why OpenWeatherMap add-on is lighter than other weather add-ons? OpenWeatherMap add-on does not have any panel view and hence there is no extra memory usage to display the weather condition in the panel. It only fetches some resources from OpenWeatherMap website to update the badge and tooltip once per 5 minutes. Can I change the 5 minute period of checking weather condition? Not at this moment. To make the extension simple, there is no options page. You can open a bug report and request one if you believe 5 minute period needs to be adjustable.